SoCCSKSarGen is a region of the Philippines, located in central Mindanao, and is officially designated as Region XII. The name is an acronym that stands for the region's four provinces and one of its cities: South Cotabato, Cotabato, Sultan Kudarat, Sarangani and General Santos City. The regional center is Koronadal City located in the province of South Cotabato. 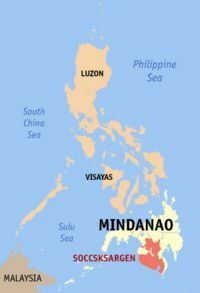 Cotabato City, though geographically within the boundaries of the province of Maguindanao, itself is part of SOCCSKSARGEN, and is independent of that province. Maguindanao province is a part of another special region called the ARMM which has its seat in Cotabato City. Geographically, the region has extensive coastlines, valleys and mountain ranges. Known for its river system, the region is the catch basin of Mindanao. The system is a rich source of food, potable water and energy production. Cotabato contains the Rio Grande de Mindanao, which is the longest river in Mindanao and the second longest in the Philippines.